The gruesome murder of a young French physician draws aristocratic investigator Sebastian St. Cyr and his pregnant wife, Hero, into a dangerous, decades-old mystery as a wrenching piece of Sebastian’s past puts him to the ultimate test. Regency England, January 1813: When a badly injured Frenchwoman is found beside the mutilated body of Dr. Damion Pelletan in one of London’s worst slums, Sebastian finds himself caught in a high-stakes tangle of murder and revenge. Although the woman, Alexi Sauvage, has no memory of the attack, Sebastian knows her all too well from an incident in his past—an act of wartime brutality and betrayal that nearly destroyed him. As the search for the killer leads Sebastian into a treacherous web of duplicity, he discovers that Pelletan was part of a secret delegation sent by Napoleon to investigate the possibility of peace with Britain. Despite his powerful father-in-law’s warnings, Sebastian plunges deep into the mystery of the “Lost Dauphin,” the boy prince who disappeared in the darkest days of the French Revolution, and soon finds himself at lethal odds with the Dauphin’s sister—the imperious, ruthless daughter of Marie Antoinette—who is determined to retake the French crown at any cost. C. S. Harris has written more than twenty novels. 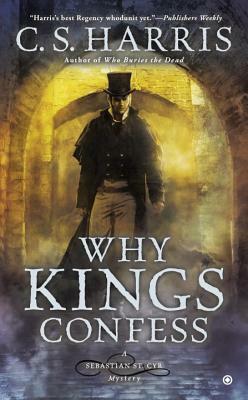 Why Kings Confess is the ninth book in the Sebastian St. Cyr mystery series, following What Darkness Brings, When Maidens Mourn, and Where Shadows Dance. Harris is also the author of the C. S. Graham thriller series coauthored with former intelligence officer Steven Harris, including The Babylonian Codex, The Solomon Effect, and The Archangel Project, and, writing as Candice Proctor, is the author of seven award-winning historical romances, including Beyond Sunrise and Midnight Confessions. A respected scholar of nineteenth-century Europe, she is also the author of a nonfiction historical study of the French Revolution entitled Women, Equality, and the French Revolution. She lives in New Orleans with her husband and two daughters.